Alumni associations and networks are a great way to stay connected with friends and classmates. You can find and join alumni associations both in Australia and back home based around your particular institution, the course you studied, or other students from your country. Most groups and clubs are online, so it’s easy to be an active member. Keep in contact – After study, you and your classmates will join the workforce or go on to further study all over the world with your Australian qualifications, and regular social events will allow you to stay touch. Support – Family and friends at home will welcome you home, but an alumni network is full of people who’ve been where you are and have grown from the experience personally and professionally. Employment and career – Fellow alumni who work in your field can be a great resource when you’re establishing your career. They can provide guidance on your industry and who’s hiring through alumni newsletters and publications. Benefits – Your provider is home to services that will still be valuable when you graduate. Whether it is libraries and laboratories or the coffee shop, alumni membership often gets you a discount. Give Back – Alumni groups are great to match peers and mentors among former and current students, and being an alumnus gives you the chance to help another student navigate life and study the way you once did. Alumni groups organise many charity and community activities, so being a member makes it easy to take part. If you decide you want to undertake further study or work in Australia you will need to check whether your visa allows this or whether you need to apply for a new visa. You can go to the Department of Immigration and Border Protection (DIBP)(opens in a new window) website to check your visa conditions and find out what your options are. Wherever your path leads, think about joining an alumni group from your institution. It will help you stay in touch with your classmates, and can provide you with great benefits and opportunities. Getting exam results, which aren’t part of your academic qualification, from your institution. Claiming the security bond back from your rental accommodation. Many institutions run information sessions or seminars with advice on returning home and adjusting to life outside of Australia. Ask your international student support staff for more information. 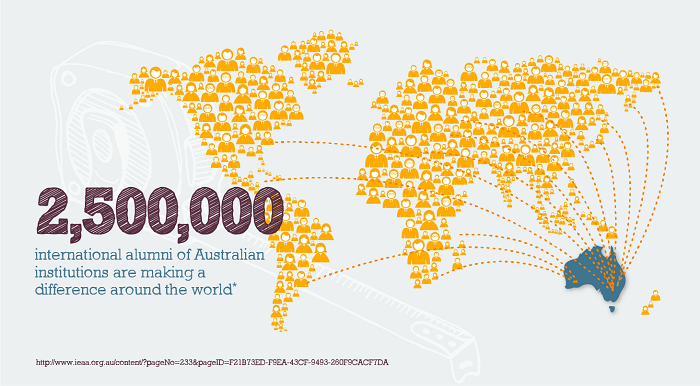 Your Australian qualification will make you an attractive employee, not just to employers at home, but those in Australia and around the world as well. If you are considering staying in Australia and working after your current visa expires, you’ll need to get a new visa that lets you do this. There are a number of options, so work out what best fits your situation. If you completed a Bachelors, Masters or Doctoral degree, you may be eligible for the Post-Study Work stream of the Temporary Graduate (subclass 485) visa. Alternatively, a new employer may be able to sponsor you for a new visa– talk to their Human Resources or Recruitment staff. If you want to stay in Australia independently of employer sponsorship for a longer term or professional career, you can submit an Expression of Interest (EOI) through SkillSelect(opens in a new window). You can find out more about your visa options at the Department of Immigration and Border Protection website(opens in a new window). Wherever your post-graduation path leads, think about joining an alumni group from your institution. It will help you stay in touch with your classmates, and can provide you with great benefits and opportunities.